The ultimate Lake George area resource with nearly 9 million page views per year, more than 169,000 Facebook fans and 29,000 newsletter subscribers. Do you target the robust Lake George area market? 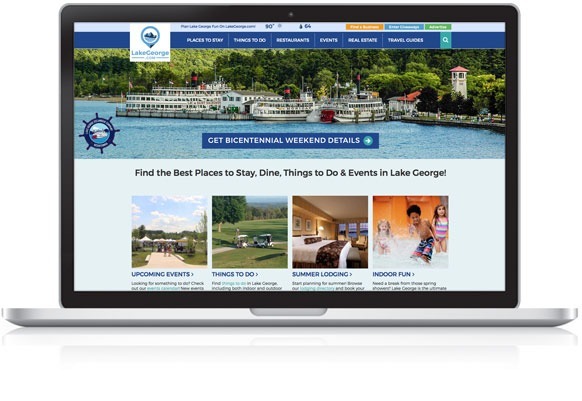 Then you need visibility on LakeGeorge.com – the area’s most trusted lifestyle and tourism website, backed by a talented team of marketing specialists. You’ll reach an ideal, target audience: Site visitors are predominantly college-educated, 35 and older with incomes over 60K. Ready to create a custom, results-oriented marketing campaign for your business? Looking for a cost effective way to reach a wider, regional audience? Advertising and marketing your business with LakeGeorge.com is often the most affordable, yet highly successful solution in your marketing mix.